grandma's cookie jar: Their Poppa Was There - Please Check This Post on the Legacy Coalition - Grandparenting Matters Facebook Page! Their Poppa Was There - Please Check This Post on the Legacy Coalition - Grandparenting Matters Facebook Page! 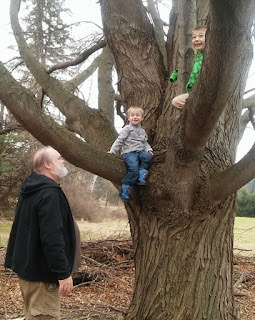 A couple weeks ago I posted a photo on the Legacy Coalition - Grandparenting Matters Facebook page of my grandsons climbing our "family tree" - an enormous maple tree which their grand uncle and dad climbed when they were boys and carved the names of all our family members on the branches. I wrote about Isaiah 49:16 and how God's love for us is everlasting and faithful and spoke about helping our grandchildren - no matter their age - love, know and follow their loving and faithful God all of their lives. Ten days ago I mentioned one more thing about the photo of my grandsons in this tree . . . did you notice the boys' Poppa is in the photo, too? When our grandsons where up in this enormous tree, he was standing right there, watching over them, ready to help - or catch them, should he need to do so. The boys knew this and enjoyed their time in the tree, trusting Poppa was there to catch them if the need arose! I'd be so honored if you took a moment to check my post at this link (scroll down to March 21, 2016) and discover why I shared this post. I'd be very delighted and honored if you shared the Legacy Coalition - Grandparenting Matters Facebook page with the people you know . . . and check it out yourself! I post every day on it and we have three other writers (Sherry Schumann, Bill and Nicole Gibbons) who post - one posts at least five times a week and the others usually two times. They are excellent writers and share their hearts for loving their grandchildren and passing on a heritage of faith! Please consider this your personal invitation to join us on the Legacy Coalition - Grandparenting Matters Facebook page! We would love to read your input and comments!